Challah if you hear me! Wake up! Wake up! It’s an emergency! Turns out the emergency was an emergency rainbow outside our window. I totally appreciated seeing the rainbow – it was a magnificent one, but at the same time, I was kind of like, was it really an emergency? The rainbow disappeared soon after we took some photos of it, so I kinda sorta guess it was? Well, it wasn’t so much an emergency as a time sensitivity thing, but if I can start all my days looking at rainbows, I’m not going to complain, especially since we then had our morning coffee ritual and then spent the day baking and cooking. 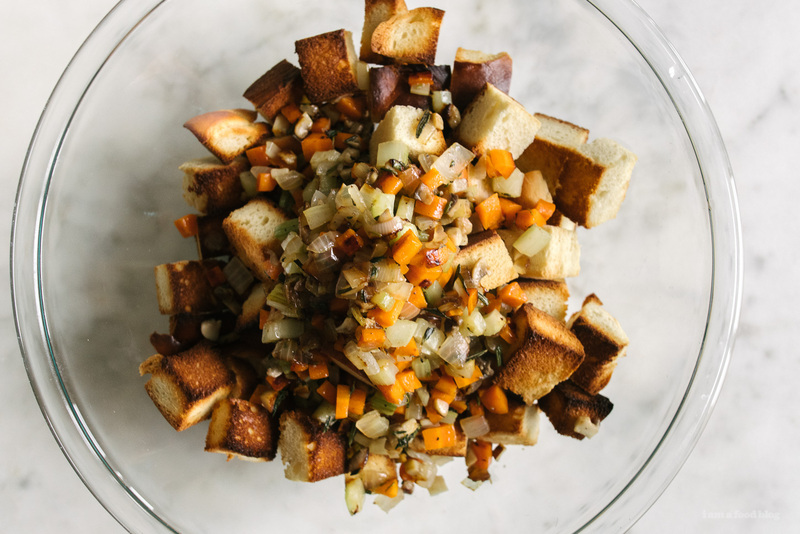 It was a good one, kinda like this challah stuffing. 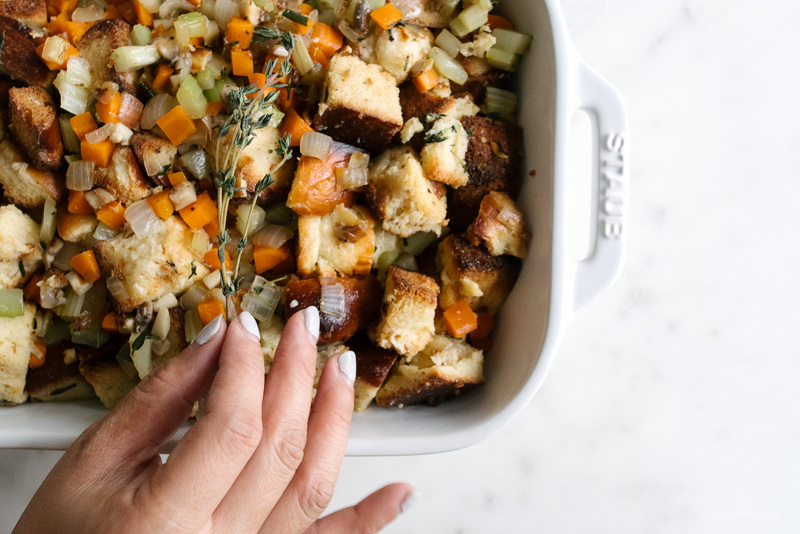 I love the squishy comfort of stuffing, especially when it’s studded with mushrooms and all the good herbs :) Hope this guy makes an appearance at your Thanksgiving table this year! In a large sauce pan, melt the butter over medium heat. Add the onion, celery, carrot, and mushrooms and cook until golden and soft, stirring often, about 10 minutes. 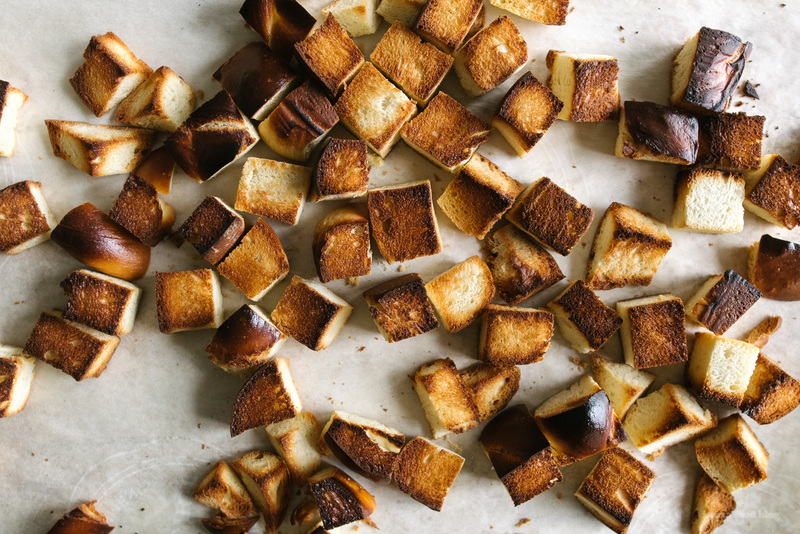 Place the toasted bread cubes in a large bowl. Add the vegetables, herbs, stock, egg, and salt and pepper. Place in a oven-proof baking dish and cover with foil. 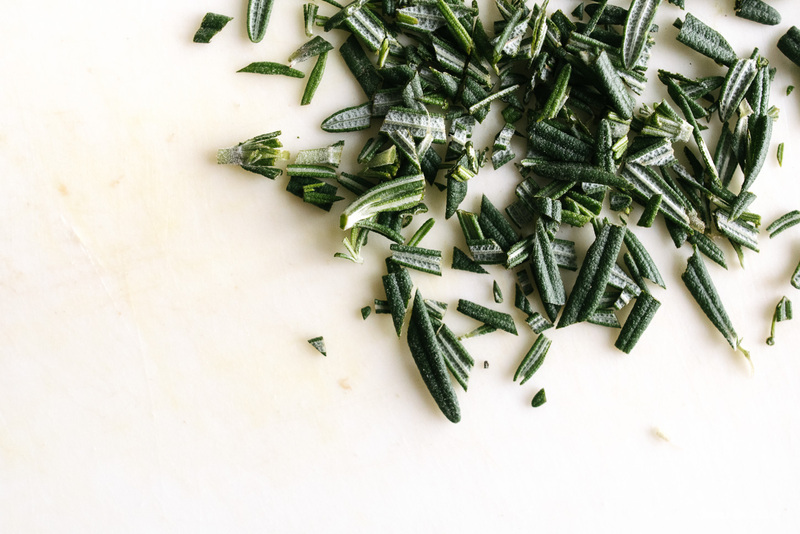 Bake for 30-40 minutes, remove foil and bake for an additional 10 minutes to crisp up the top. Enjoy! 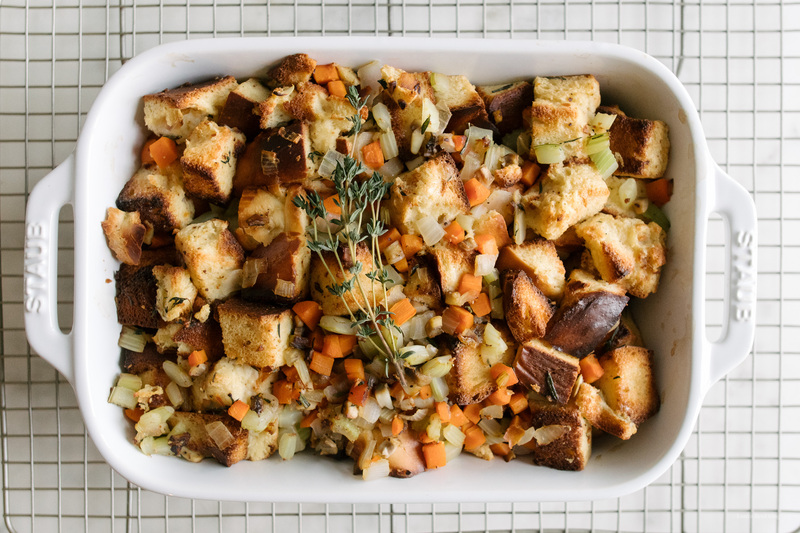 What a great way to do this year’s stuffing! Just in time to make the turkey day menu too! 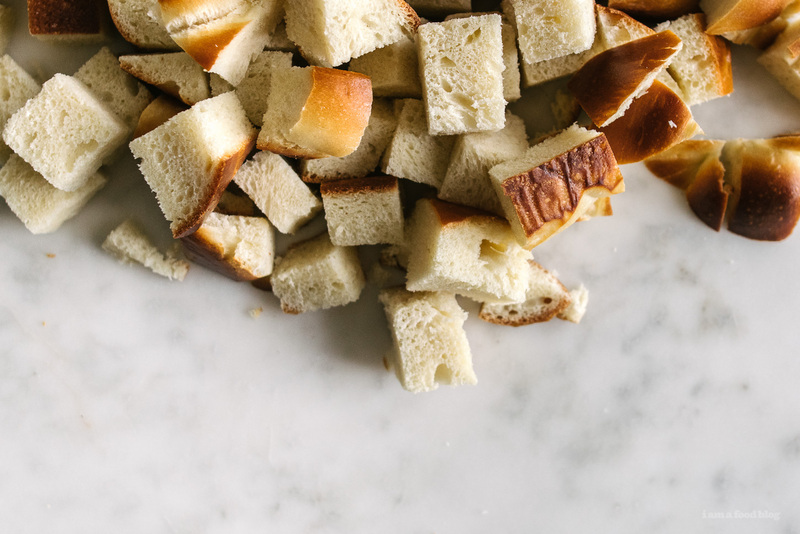 Challah bread is delicious and I never thought of using it for stuffing. Great recipe. TOTAL EMERGENCY!!! And i’m so making for tday this year. looks yummy. maybe add some oysters? 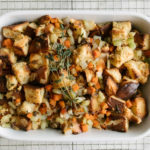 Challah makes the best stuffing!!! Its dense egg-y texture is PERFECT for soaking up all the flavors! This looks delicious, and it has mushrooms!!! I love love love stuffing with mushrooms!